If you’ve just embarked upon your first Scrum project, or suspect you might be soon, there are a few basics you’ll need to know. The term “Scrum” was first introduced in a 1986 article by Takeuchi and Nonaka, published in the Harvard Business Review. It then resurfaced in 1995 at the Business Object Design and Implementation Workshop, and gained even more traction in 2001 with Ken Schwaber and Mike Beedle’s book, Agile Software Development with Scrum. The Scrum Alliance was founded in 2002. Today, Scrum is used by huge companies like Adobe, Amazon, Apple, CNN, Facebook, Google, and Microsoft to manage various aspects of their business. 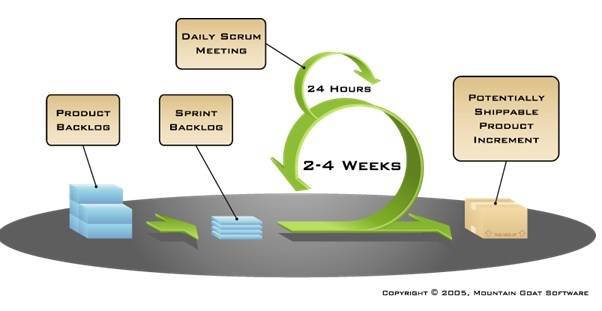 Scrum project teams are broken up into cross-functional, self-organized teams, and project requirements are stored in the product “backlog”generally in the form of user stories. The project progresses in 2-4 week iterations of work called “sprints”. No (or very limited) changes can be made to a team’s Sprint “backlog” during a sprint, which keeps a team focused. The product is designed, coded, and tested during each sprint, resulting in a “potentially shippable” product increment. Scrum Team: a cross-functional team of developers, testers, user experience experts and business analysts. Typically should be 7 people plus or minus 2. Do you have any impediments/stumbling blocks? Sprint Review: To promote transparency and give stakeholders a chance to provide feedback, this is held at the end of each sprint. The team gives demos of deliverables, which are accepted or rejected by the Product Owner. This helps prevent the “Big Bang” effect at the end of a project where stakeholders are surprised by a deliverable (positively or negatively). Sprint Planning: This happens once per sprint at either the beginning or the end. The team commits to a set of user stories, that have been prioritized by the Product Owner, that they believe can accomplished by the team in the sprint. The user stories are broken down into tasks, and the tasks are estimated in hours (whereas the user stories are generally estimated relatively in story points far prior to this meeting). The result? A sprint backlog. Product Backlog: comprised of user stories and consisting of features, bugs, technical work, and knowledge acquisition, the product backlog is ever-changing and evolving due to stakeholder feedback. 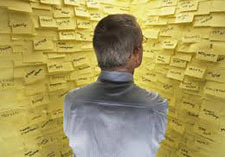 The backlog is owned by the Product Owner whom prioritizes it and keeps it clear and concise. Sprints: regular, repeatable word cadences. A product release consists of and progresses via a series of sprints. These should not exceed 30 days—the typical length is two weeks. 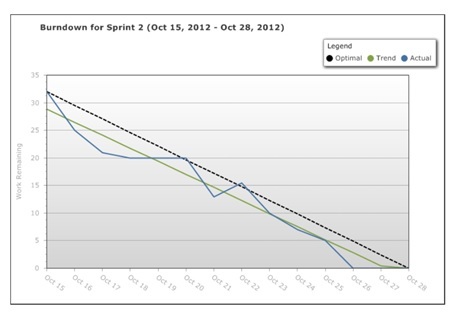 Burndown Charts: A way to visually gauge the progress of a team during a sprint. Scrum is a simple “inspect and adapt” approach. It can really be applied anywhere and is scalable from small to big projects. Outside of software development, I’ve seen it implemented in Manufacturing, Marketing, Sales, and Engineering. You may have heard of some of these: Kanban, Extreme Programming (XP), Scrumban,Test Driven Development (TDD), Feature Driven Development (FDD), and Lean.